Considering getting a bindi piercing? If the answer is yes, then read on to find out everything you need to know about this bridge piercing! Resembling a style of facial embellishment demonstrated within many Asian countries, the bindi piercing, also known as the vertical bridge or unicorn piercing is a piercing that has grown in popularity over the years. Rather than horizontal, this variant is vertical and can be placed wherever the anatomy allows, therefore if there is not enough excess skin across the bridge a bindi piercing can be placed higher. With its appealing appearance, the bindi piercing is perfect for those that are looking to showcase something different and unique. The location of the piercing allows for the wearer to show off their choice of jewellery on any occasion, creating an eye catching, alternative, and alluring style. 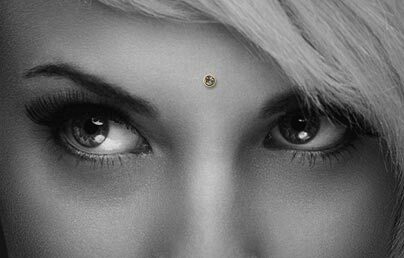 Bindi piercings are available as either a form of surface or microdermal piercing. 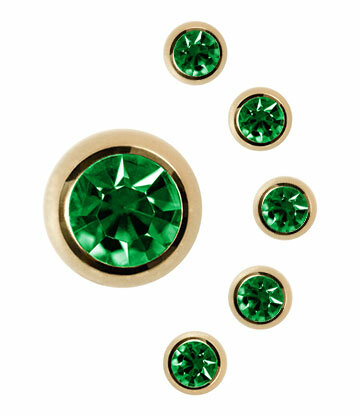 By placing micro dermal anchors beneath the skin, jewellery can be interchanged easily. Although this style may suggest a faster healing period, we highly recommend you discuss this option with your piercer. The bindi piercing is located on the forehead, often just above the bridge of the nose. After cleaning the area and marking a grid to enable a straight piercing, the piercer will need to pinch the skin to allow the hollow needle to create the piercing channel. From there, the jewellery is then inserted. It is important to ensure that the grid marks a symmetrical placement; if the piercing is not symmetrical this could potentially affect the existing symmetry of the face. We highly recommend visiting a professional and skilled piercer that has credible experience in dealing with this style of piercing. Unfortunately not everyone is suitable for a bindi piercing. Those with a lifestyle that is heavily sports orientated are highly recommended to discuss the effects of the piercing with their piercer. In many situations, depending on the piercing location and sport, they may suggest impact resistant jewellery or flexible retainers after the healing process. It is worth noting that in the case of bridge piercings, including bindi piercings, it is highly important to determine whether there is enough free, loose skin available to perform the piercing. If there isn’t enough loose skin the piercing may shift over time and could potentially break the skin. With this in mind, it is highly important that you discuss your suitability, lifestyle choices, and positioning with a piercer that has plenty of experience in this field! Most people report that a bindi piercing, either surface or microdermal, is moderately less painful than many other piercings. However, it is worth bearing in mind that everyone experiences pain differently, so this ‘pain rating’ is purely anecdotal. Within the first few days it is common to experience some forms of swelling and soreness which often disappears soon after. If this is not the case, and the pain/swelling/redness continues, it is heavily advised that you seek medical attention immediately. It is highly important to note that with any facial piercing, a scar will be visible when the jewellery is removed. As the facial skin is both soft and malleable, allowing the piercing to move freely with the changing shape of your face, a small hole may be visible once the jewellery is removed. This can easily be concealed with forms of makeup. This piercing typically takes between 4 – 6 months to fully heal, however this is purely dependant on the individual. It’s important to maintain good standards of hygiene and a through aftercare routine to avoid the risk of infection. It is advised that you clean the piericing with a sterilized cotton ball and salt water solution at least twice a day to help reduce the risk of infection. Avoid swimming/water sport activities until after your piercing has healed. If that isn’t possible then it is highly recommended that you cover the piercing area with suitable dressing, such as a waterproof eye-patch, that will both protect and prevent the piercing from becoming infected. The migration of a piercing is where the piercing begins to move towards the surface of the skin. Such a process can sometimes occur over a period of weeks, months, or even years. Once the migration process begins, there is unfortunately nothing that can be done to prevent it. It is highly recommended that once you notice any signs of migration that you remove the jewellery immediately and let the pierced hole heal naturally, avoiding the potential for a large tear. If you have any queries or are concerned that your piercing is migrating, it is highly recommended that you seek professional guidance. The bindi piercing can accommodate a wide range of jewellery. Typically, 1.2mm – 1.4mm gauge jewellery is used in the piercing process, though smaller or larger jewellery can be worn once the piercing has fully healed. 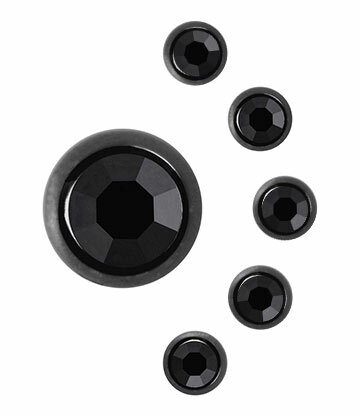 If you plan to wear jewellery of a larger gauge, we recommend discussing this prior to getting the piercing, or paying a visit to your piercer (once you’ve fully healed) to ensure your piercing can accommodate some stretching and that your anatomy is suitable prior to changing your jewellery. Depending on whether you opt of for a surface or microdermal bindi piercing, there is a lot of choice when it comes to bindi piercing jewellery, ranging from dermal rings to gemstones.